Size: approx. 12 mm. Photo: 09/02/14, 10 pm. 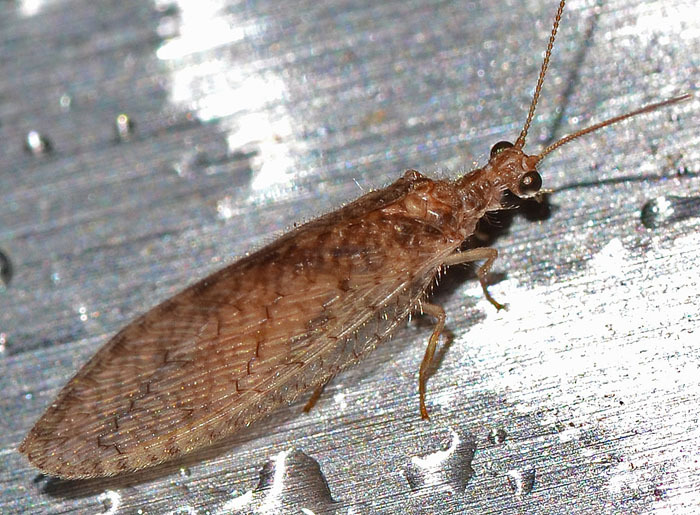 This brown lacewing is probably Micromus posticus. I found it on our grill after a rain shower that had scared away most of the other bugs. Larvae and adults of Micromus feed on aphids and have been used in biological control programs. M. posticus prefers aphids infesting citrus groves, pecan orchards, cotton and potato fields. It is less prone to be parasitized by ichneumonid wasps than certain other Micromus species.